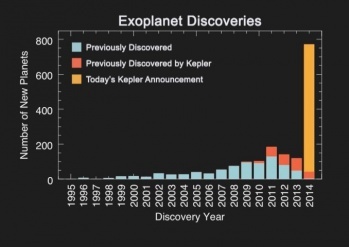 Data from NASA's defunct Kepler spacecraft reveals 715 new planets outside of our solar system, strengthening the case that Earth-like planets appear to be commonplace in the universe. NASA's Kepler spacecraft ended its planet-hunting mission in May 2013 after suffering a mechanical failure, but that hasn't stopped its legacy from continuing to make headlines. Using data that Kepler collected in 2009 and 2011, astronomers Jack Lissauer and Jason Rowe of NASA and SETI, respectively, have confirmed the existence of 715 previously-unknown extrasolar planets. In two papers published in the Astrophysical Journal, Lissauer and Rowe detail the 715 planets, which include four planets in the habitable zone of their stars - the region also known as the "Goldilocks zone," because it is neither too hot nor too cold for water to exist in liquid form. "These new results continue to strengthen the case that Earth-like planets appear to be commonplace in our Universe, even if they remain devilishly difficult to discover and characterize," says planet hunter Alan Boss of the Carnegie Institution for Science in Washington DC, who was not part of the studies. The 715 planets are distributed among 305 multiplanetary systems that feature orbits similar to compact versions of those from our Solar System. Many of the extrasolar planets are larger than Earth - the four found in the Goldilocks zone are roughly twice the size of our planet - but that can be attributed to the fact that it is easier to detect larger planets.